Every day, the mobile money industry processes over $1 billion and generates direct revenues exceeding $2.4 billion yearly, according to GSMA’s 2017 State of the Industry report. In fact, mobile money transactions in Kenya have now exceeded the country’s gross domestic product according to estimates by ICTworks. No small feat for a platform introduced a little over a decade ago in the African nation where today, five operators coexist. The poster child of mobile money success, Kenya demonstrates the massive scope for the platform as an enabler of economic growth. Mobile money has enabled financial inclusion of millions of people by empowering them with digital financial services. Without taking away from its unparalleled success, it is important to note that mPESA – at the forefront of Kenya’s mobile money revolution – entered a largely unbanked market, with minimal competition, relied heavily on agents for transactions, and used first-generation, feature phones as the main conduit of transactions. Whether in the developed or developing world, few parallel examples remain. Today, operators must organically build complex and varied ecosystems to attract money into the platform and creating incentives to remain in the system. The key measure of how useful money is within a given mobile money ecosystem is the digital circulation ratio. A measure of how many times money is transacted before being cashed out. Simply put, increasing the digital circulation ratio involves increasing reasons to enter and stay in the system. Using a mobile money platform helps people build their credit scores, making them eligible for microloans through financial institutions. The score is calculated based on the transaction type, history, transaction value, location, services used, frequency of use, and so on. GSMA states that in 2017, digital circulation averaged 1.6x. However, deployments that successfully scale merchant payments have a ratio closer to 4x. Further, the most successful providers are those whose platforms offer a vast payments ecosystem; each one, on average, is integrated with seven banks, at least 90 billers and 30 organizations for bulk disbursements, and 6,500 merchants. Retailer payments to suppliers: Suppliers now become part of the system by virtue of receiving payments. 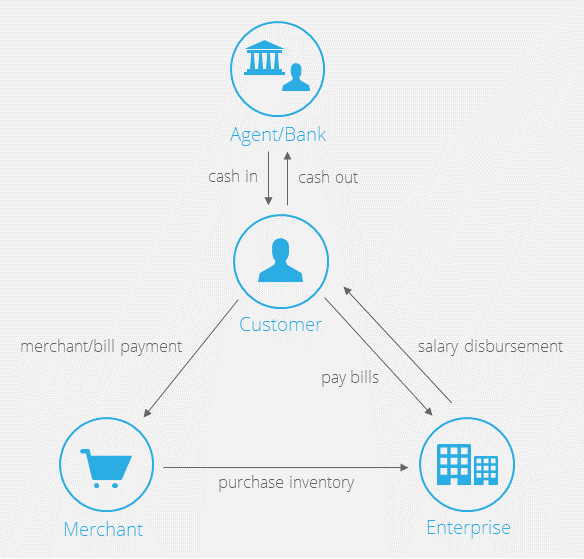 Supplier payments to enterprise: By having the option of making payments through the platform, the suppliers remain within the system instead of cashing out once they receive payments. Enterprises disbursing promotional cashbacks or employee salaries: Now, the enterprise has reason to continue using its money through the system. Building such business lines requires high flexibility, not only to create different rules and policies for each business line, but also to provide business entities with internal autonomy. Flexibility provides capability, but to turn it into opportunity, the vital factor is trust. Thankfully, trust can be mediated using private blockchain. In creating a more diverse and complex ecosystem, it is essential to bring in major partners such as government agencies, large corporations, non-profits, and various other entities – all of which must command trust. How is trust between various entities facilitated? The answer is blockchain, where a tamper-proof ledger of all financial transactions is maintained by and shared between selected partners. At Alepo, we strongly believe that the ability to easily roll out blockchains to partners could be a game-changer. While fully decentralized blockchain-based mobile money systems have limited appeal owing to lengthy transaction times and increased costs, private blockchains can help to create highly regulated and trustworthy relationships between various major entities that participate in the ecosystem. In such an environment, the blockchain ledger is only shared with select third parties and is opaque to other participants in the system. Mobile money systems need to create opportunities at every level and build their own ecologies, rather than relying on tapping into societal and/or economic factors. They need to have advanced partner and business channel management, flexibility in how these channels are monetized, as well as capabilities to monetize customer data itself through innovative services such as microloans. As the systems become more diverse and complex, there is a diversity in monetization methods that can be employed – analytics, advertising, revenue-share models, and more. For the success of any system, it is crucial to choose a platform that can support different business models and multilayer disbursements. Is the Telecom industry finally surging ahead for growth in 2017? What’s Driving BSS Transformation for Leading CSPs? 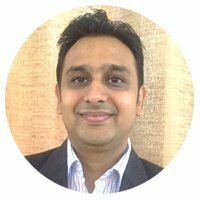 Pankaj Garg is a FinTech expert who is passionately engaged in managing mobile financial solutions at Alepo. Backed by over 12 years of experience in the software industry, he offers unique insight while designing solutions to match industry demands. Always up to speed with the newest advancements in the products he handles, he takes it slow only when he’s road-tripping across India to discover new places.